If there's one thing in this world I couldn't live without, it would be garlic. Okay, well I definitely also couldn't live without my husband, son, family, friends, home, chapstick, toothbrush...well, I guess there's a lot of stuff. But I promise garlic is pretty high up there. Roasted garlic takes some time to prepare, but it's really easy to do and can be used in numerous recipes. 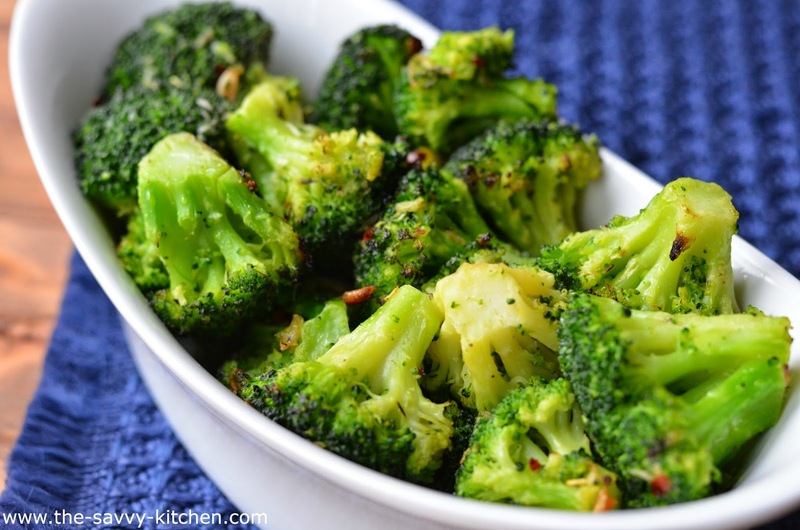 I decided to toss it with olive oil, red pepper flakes, salt and pepper to dress up a side of broccoli, and it was incredible. The garlic gets double roasted and the little bit of spice takes it over the top. 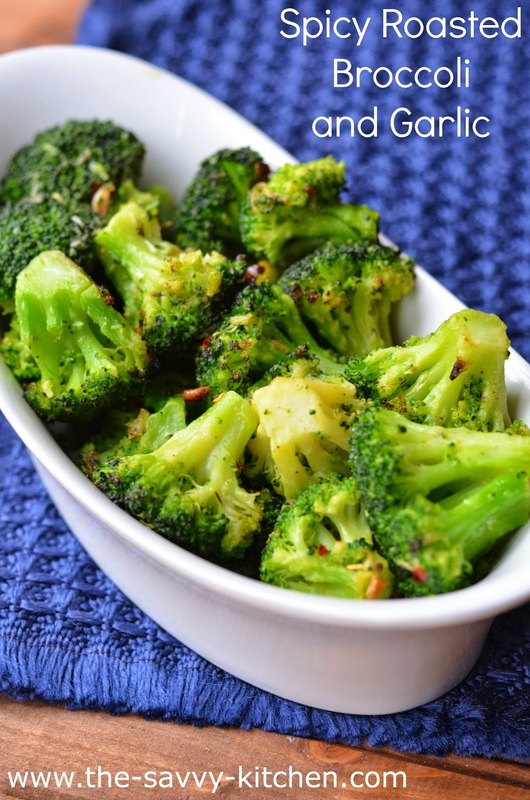 Such an awesome side dish. Enjoy! In a large bowl, combine the olive oil, red pepper flakes, salt and pepper. Squeeze the roasted garlic out of the cloves and add to the bowl. Mash with a fork into the oil combination. Add broccoli and toss to coat. 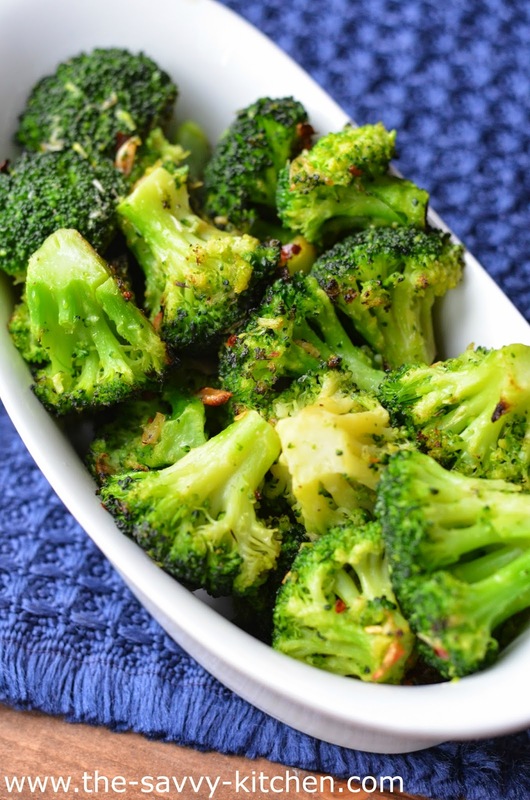 Spread broccoli on a baking sheet. Bake for 20 minutes or until tender. Roasted garlic is something that I think everyone knows how to make. It's such a simple staple and amps up the flavor of anything it touches. It's an extremely easy skill to have on hand, so I want to share the foolproof "how to" instructions with you! The uses for this are endless. In salad dressing, on pasta, on pizza, garlic bread topping...it's really universal and a great thing to have in your back pocket! Cut off the top of the head of garlic. Drizzle with olive oil and sprinkle with salt and pepper, if desired. 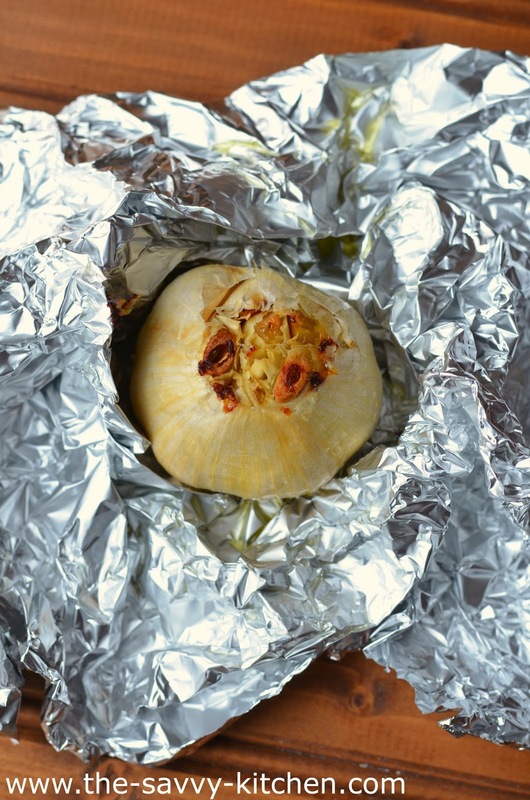 Place garlic on a piece of aluminum foil. 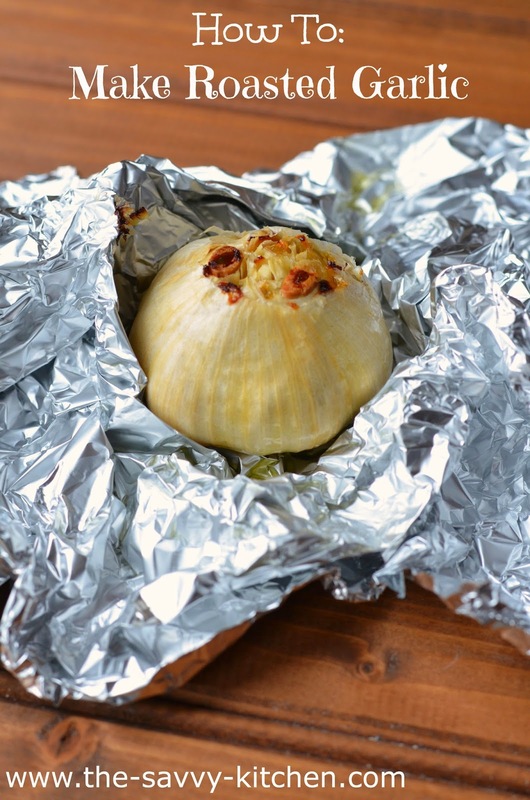 Wrap garlic tightly with foil. Place in oven and cook for 35-40 minutes. Remove from oven and allow to cool slightly. Gently squeeze so the garlic comes out of each clove. Use as desired. All I have to say is thank goodness for my mom!! When my best friend, Laura, decided it would be best to come over to my house to celebrate her birthday, I had no complaints. Since I put Bradley to bed at 8pm, instead of rushing home from dinner I was able to put him down to sleep and then go back and rejoin the festivities. But that obviously meant I was going to make her a birthday cake for when we finished up our in-home meal. When I asked Laura what kind of cake she wanted, she simply replied, "Nothing with fruit, so fatty and sweet!" Check and check. I could handle that :) I instantly decided to make this decadent cheesecake for her, but that included making a homemade crust, homemade cookie dough and homemade cheesecake batter. It takes some time, but it's totally worth it. That's why I have to thank my mom. She watched my little peanut while I prepared this treat! 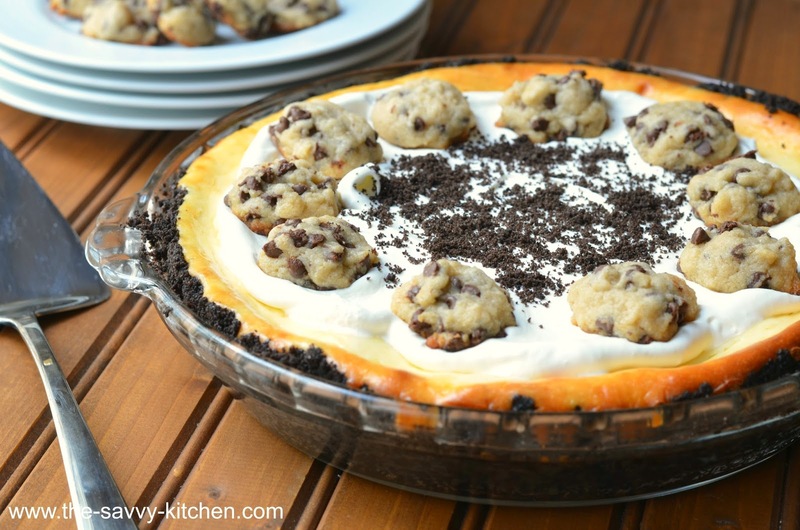 I decided to make an Oreo crust because, well, who doesn't like Oreos? I opted for a basic cheesecake recipe and spruced it up by putting in chunks of my favorite chocolate chip cookie dough. With the remaining cookie batter, I baked up mini chocolate chip cookies for the cheesecake's garnish. So cute! This cheesecake is soft, creamy and sweet. 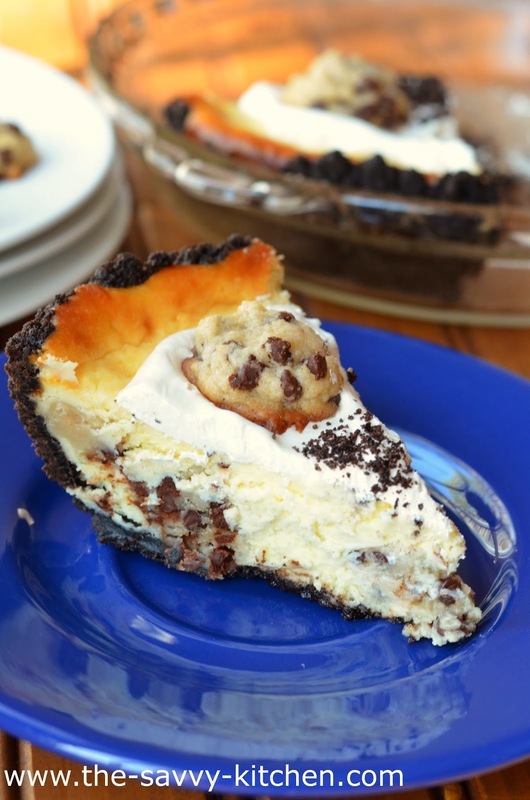 I love the chocolate crust and the chunks of cookie dough scattered around the cake. 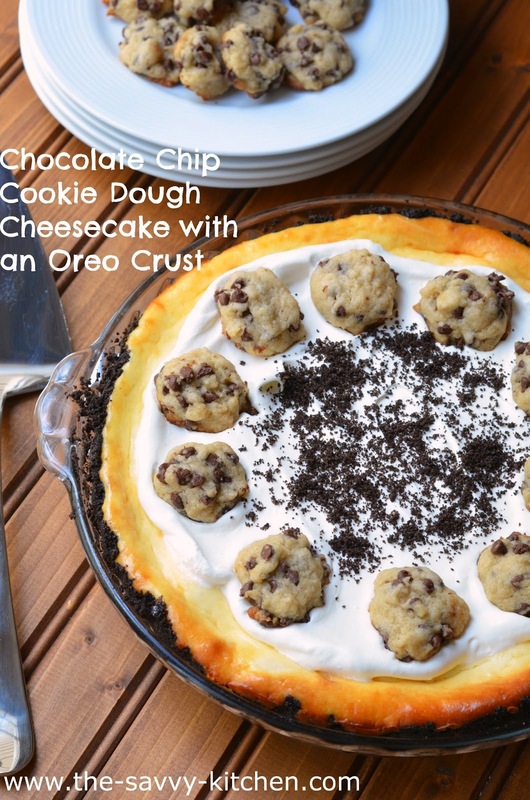 This was a huge hit and I'm positive anyone you make this for will fall in love! For the crust: Lightly grease the bottom and sides of a 10-inch pie plate. In a medium bowl, combine the butter with the cookie crumbs. Press onto the bottom and about halfway up the sides of the prepared pan. For the cookie dough: Using an electric mixer, combine the butter and both sugars until smooth. Add the egg white and vanilla and stir to combine. Mix in the flour and salt and stir just until combined. Fold in and the chocolate chips. Gently roll the dough into small teaspoon-size balls and set aside. For the cheesecake filling: Using an electric mixer on high speed, beat the cream cheese and sugar until smooth. Mix in the vanilla and sour cream. Add in the eggs and mix just until combined. Pour the cheesecake batter into the prepared crust, leaving about 1/2 inch of room from the top of the pie plate. 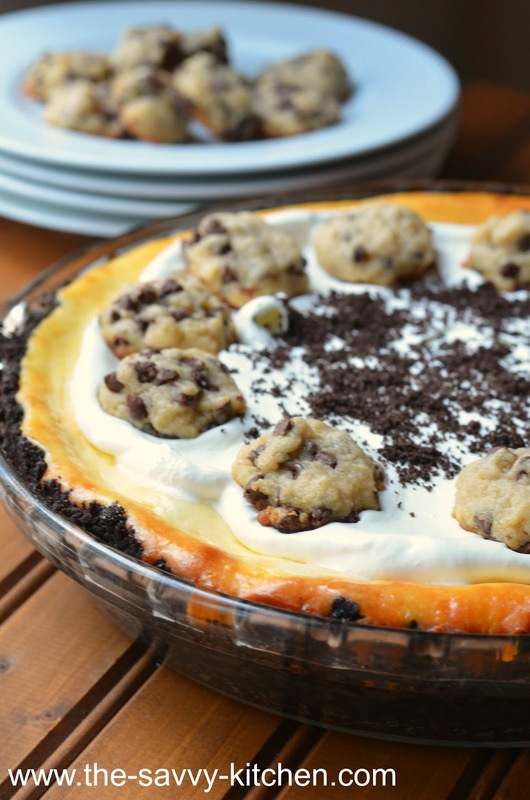 Add the cookie dough balls in an even layer over top (you will not use up all the balls). Use a spoon to gently submerge the cookie dough balls so you can no longer see them. Place the remaining cookie dough balls on a greased baking sheet and bake in the preheated oven for 8-9 minutes or until golden brown. Remove the mini chocolate chip cookies from the oven and place on a wire rack to cool. Bake the cheesecake for 50-55 minutes or until the center is set. Remove the cake from the oven and let it cool completely on a wire rack. Once cooled, refrigerate for at least 4 hours, but preferably overnight. Once chilled, spread the top with whipped cream. Sprinkle with extra Oreo cookie crumbs and scatter the mini chocolate chip cookies over top. If using fresh peaches: Wash the peaches thoroughly. Bring a pot of water to a boil. Add the whole peaches and cook for two minutes. Use a slotted spoon to remove the peaches from the water. Allow to cool slightly. Remove the skins (they should slide right off). Cut the peaches in half around the pit, and use your fingers to peel the flesh back from the pit. Discard the pits. Place the peaches in a food processor and process until smooth. No need to add water or milk since the consistency is very runny once pureed. If using frozen peaches: Bring a pot of water to a boil. Add the frozen peach slices and cook for 10 minutes, or until peaches are tender. Place the peaches in a food processor and process until smooth. No need to add water or milk since the consistency is very runny once pureed. 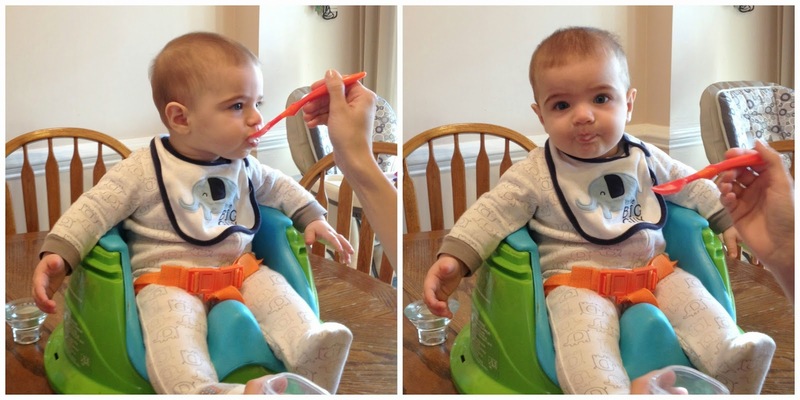 To serve: Allow to cool then serve to your baby with a spoon. If saving for a later date, pour it into storage cups to freeze or refrigerate. You can refrigerate up to 3 days or freeze for 30 days. Make sure you label your peaches! 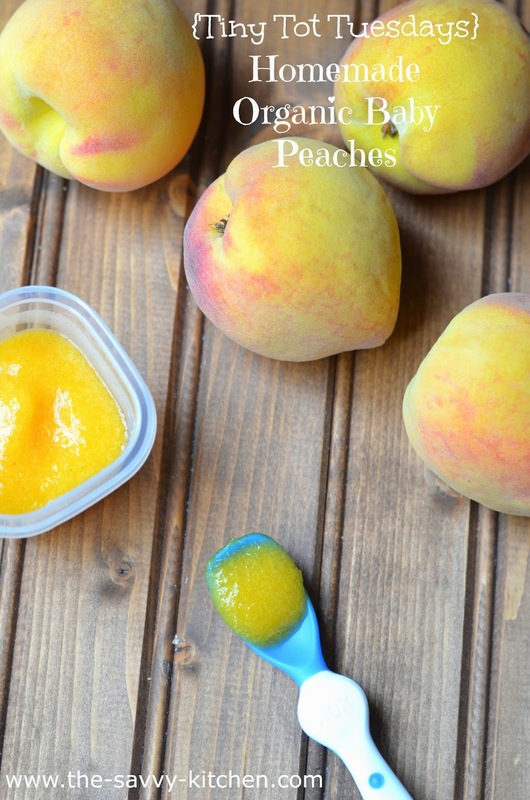 Once you are ready to serve, heat the refrigerated or frozen peaches up in the microwave and allow to cool to just warmer than room temperature. Happy Memorial Day!! I'd personally like to thank all the service men and women who have fought and continue to fight for our country and our rights. Your selflessness doesn't go unnoticed and we appreciate you. Now on to the food. This is an incredibly light and extremely tasty meal. 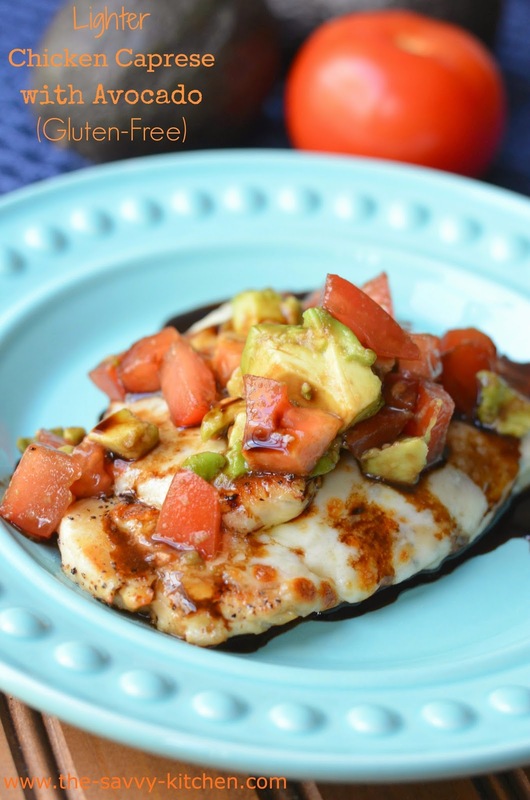 Fresh tomatoes and avocado are tossed with a garlic and cilantro-infused balsamic vinegar; a beautiful pairing if I do say so myself. 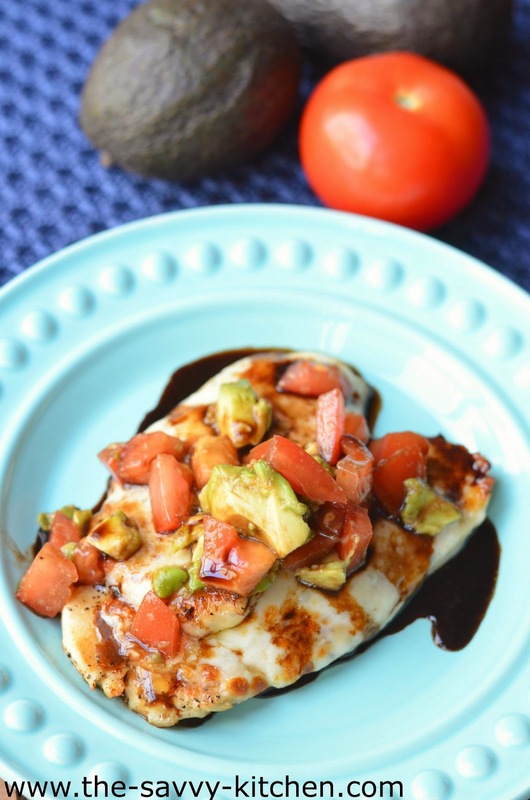 The fresh Mozzarella is melted on top of the chicken slices and then topped with the tomato mixture. Sounds like heaven, doesn't it? 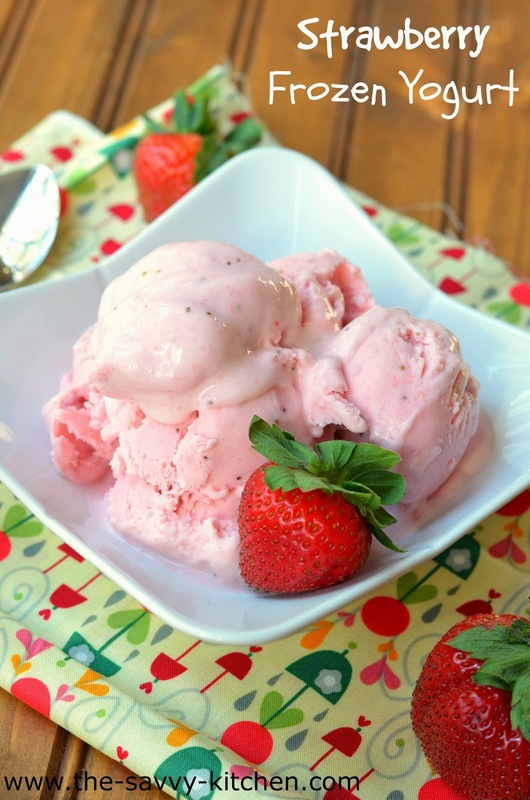 It's extremely refreshing on a hot spring day, and it's also gluten-free! Enjoy and have a wonderful holiday! Season both sides of the chicken breasts with a sprinkle of salt, pepper and garlic powder. Add oil to a large skillet and preheat to medium-high heat. Add the chicken in a single layer and cook for 3-4 minutes. Flip and continue cooking until cooked through and light brown. Remove from heat and place on a baking sheet and top with aluminum foil to keep warm. Repeat with remaining chicken, if necessary. Meanwhile, mix the tomatoes, avocado and balsamic vinegar together. Set aside. Remove foil from chicken. 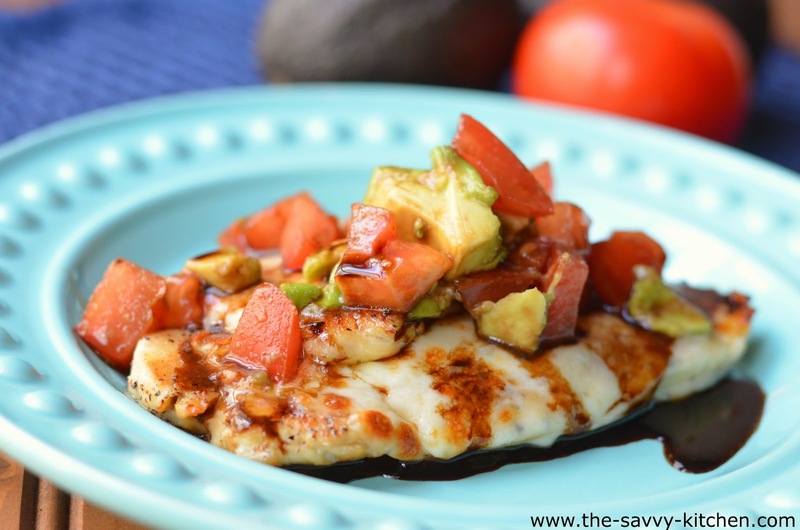 Top each piece of chicken with a slice of Mozzarella. Place under the broiler for 1-2 minutes or until cheese is melted and bubbly. Remove chicken from oven. Top each slice with a spoonful of the tomato and avocado mixture. Serve immediately. In an attempt to clean out the pantry and not let anything go to waste, I tried to be resourceful and use the seasoning packets in a chicken stir fry. I love the taste of the Ramen noodles as a whole, so why not? Yep, I was right. It was awesome. You get the flavor of the Ramen noodle soup, but it's packed into chicken and vegetables. 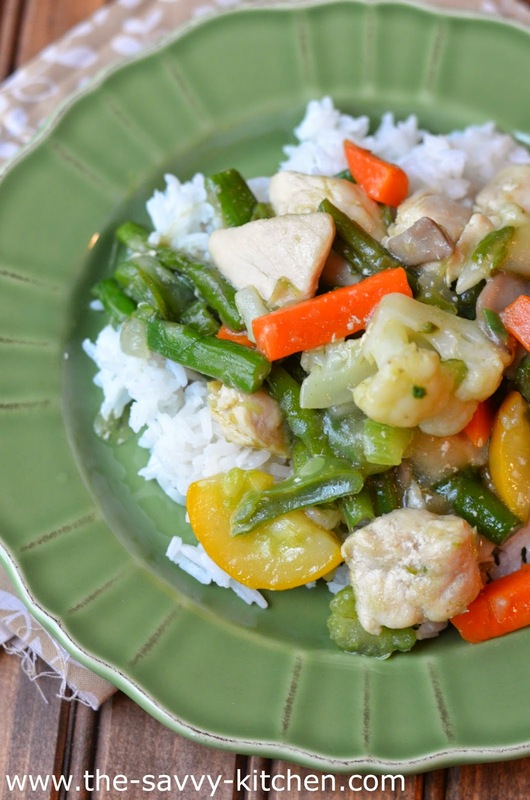 So you avoid the noodles and save some calories, too! This was super easy and incredibly delicious. Enjoy! In a large skillet over medium-high heat, add the oil. Add chicken in an even layer and cook until done, about 7 minutes, flipping halfway through. Add the frozen vegetables to the skillet. 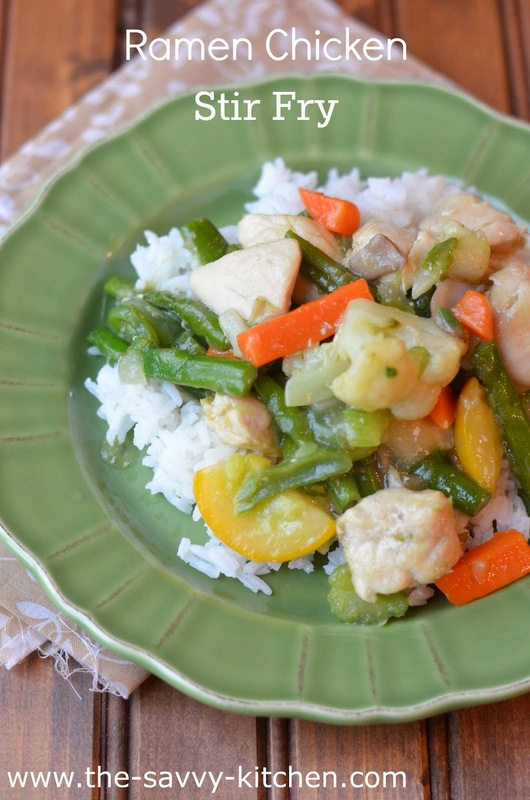 Cook for 2-3 minutes or until vegetables start to become tender. In a separate bowl, stir together the 1/2 cup water, cornstarch slurry mixture and 2 seasoning packets. Add mixture to the skillet. Bring to a boil and turn heat to low. Continue cooking until sauce thickens. 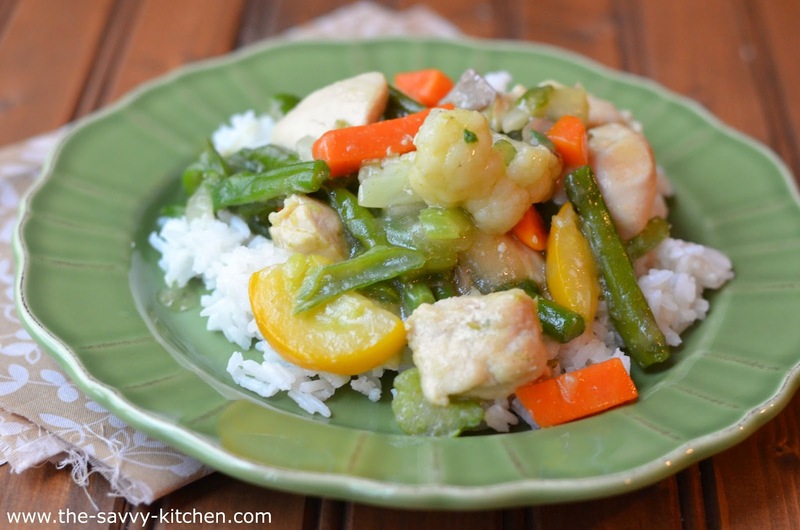 This has got to be, hands down, in my top five favorite chicken meals. I'm not even a fan of food you have to work for (crab legs, wings, ribs, etc.) so you know that's saying a lot. But my husband loves chicken on a bone, so I gladly gave up my whole "only-eat-dinner-with-a-fork" thing for him. I did it. And I loved it. I mean loooooved it. It's seriously some of the most tender chicken I've had. The trick is to let the chicken sit in the buttermilk mixture for as long as possible. The chicken becomes SO moist while cooking because of this. And the ranch flavor? Oh.My.Goodness. It's just the best. Simply the best. 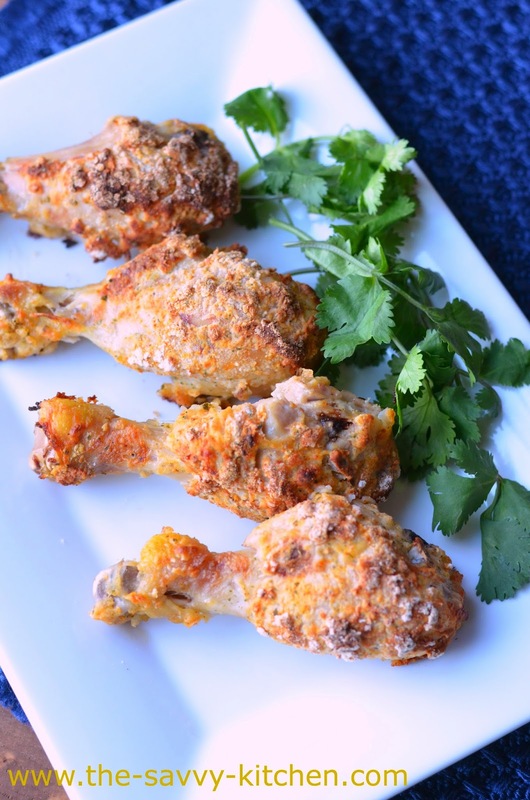 And although the drumsticks weren't fried, they still came out crispy and crunchy. So we saved some calories and still had a delicious meal. Having to work a little bit for my meal was well worth it on this occasion! Enjoy! In large resealable food-storage plastic bag, mix buttermilk, dressing mix and chicken. Seal bag; turn bag several times to coat chicken. Refrigerate at least 1 hour or overnight. Heat oven to 425°F. Line a 15x10x1-inch pan with aluminum foil and coat with cooking spray. In shallow dish, mix breading ingredients. 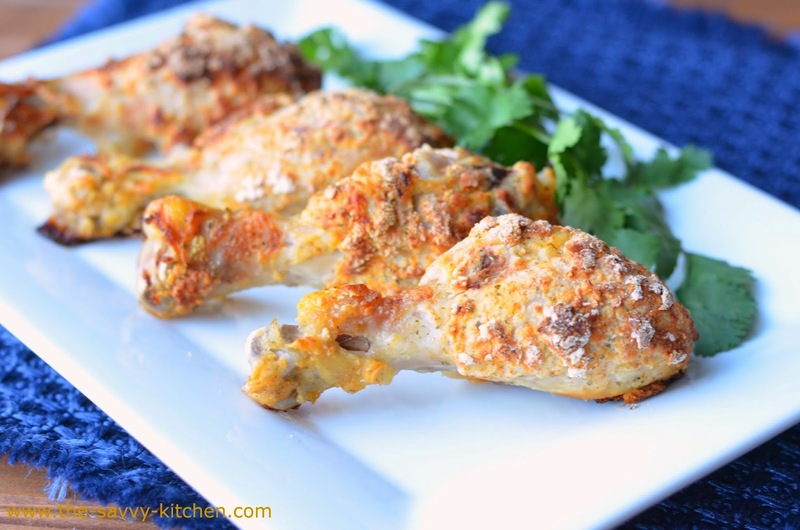 Remove chicken pieces one at a time from buttermilk mixture. Dip chicken in breading, turning to coat completely; shake off excess. Place chicken, bone side down, in pan. Lightly spray top of chicken with cooking spray. 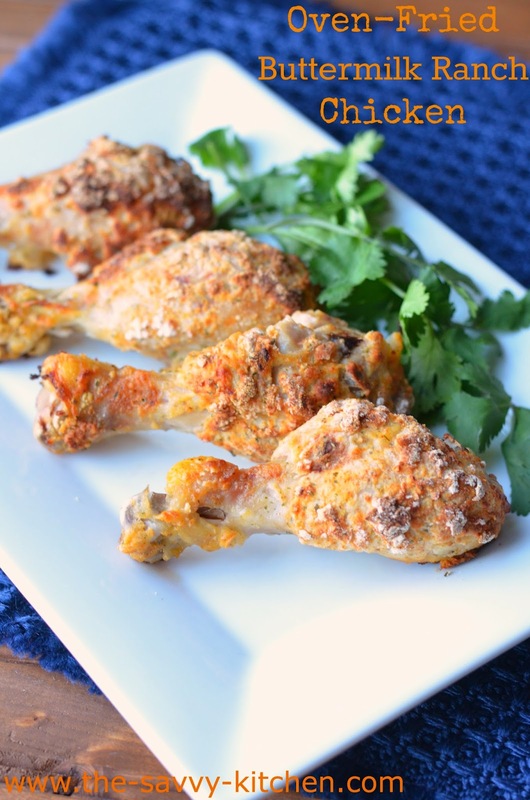 Bake 45-50 minutes, turning halfway through, or until juice of chicken is clear when thickest piece is cut to bone (170°F for breasts; 180°F for thighs and legs). This month's Secret Recipe Club assignment was Gloria's blog, Canela Kitchen. One thing I absolutely love about her blog is that she writes all of her posts in both English and Spanish. So cool, right? Gloria lives in Chile, so I love reading about her culture and the different types of food that she eats/cooks with. It's fun being able to read about someone who lives in another part of the world and to get a glimpse into a different style of cuisine. I definitely suggest checking her blog out! 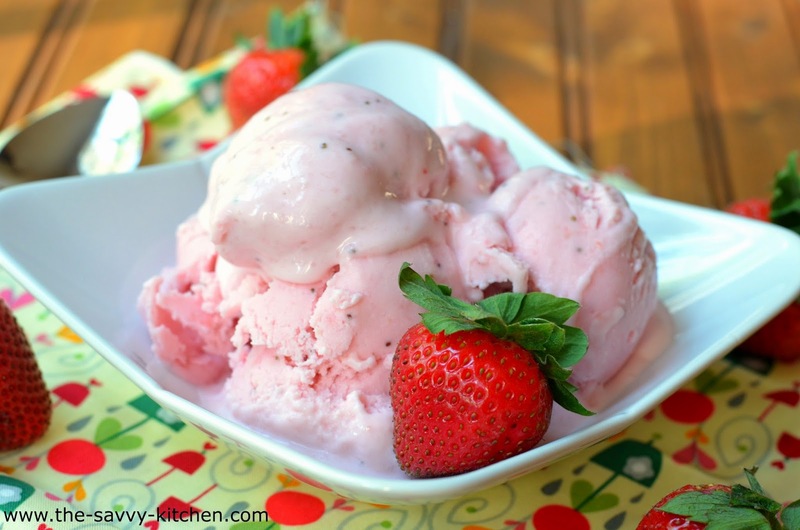 I was absolutely drawn to this frozen yogurt recipe the instant I saw it. Chris and I often walk to our local frozen yogurt shop since it's a sweet, satisfying and guilt-free treat that we both really enjoy. Being able to make it in my own home sounded right on point for our lifestyle, and it definitely didn't disappoint. It is creamy, light and fruity. It was perfectly refreshing on a warm spring evening. I will be making this again this summer and maybe even trying it out with different types of berries. Enjoy! Place the sliced strawberries in large bowl with the sugar. Stir until sugar begins to dissolve. Cover with plastic wrap and let stand at room temperature for 1 hour. Place the strawberries in a blender or food processor. Add the yogurt, heavy cream and fresh lemon juice. Pulse until strawberries are smooth. 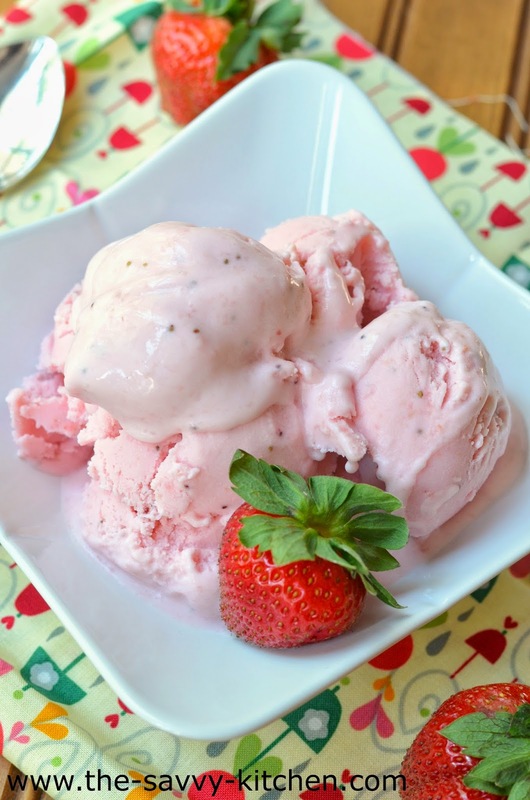 Chill mixture for at least 1 hour, then freeze in your ice cream maker according to the manufacturer’s instructions. 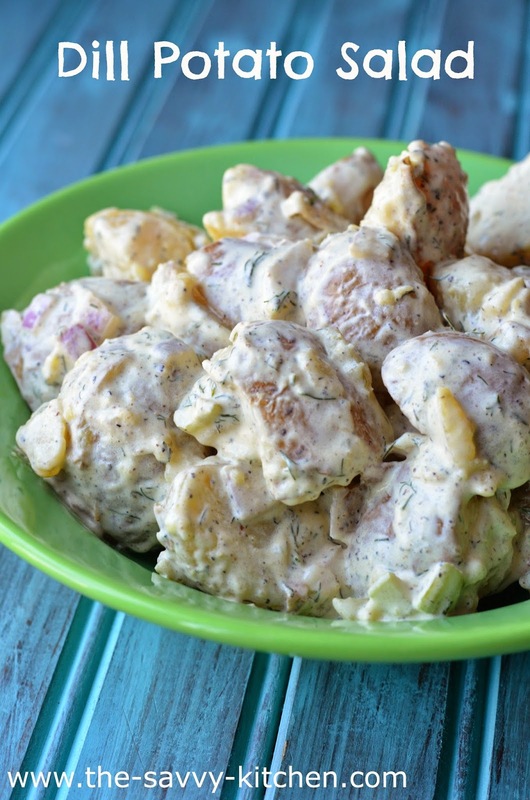 Chris and I went to our friends Leah and PJ's house a while back for a BBQ, and Leah made this potato salad which has been stuck in my head ever since. I just had to know where she got it from, but I should have known it was Ina Garten. Practically every single one of her recipes is amazing. 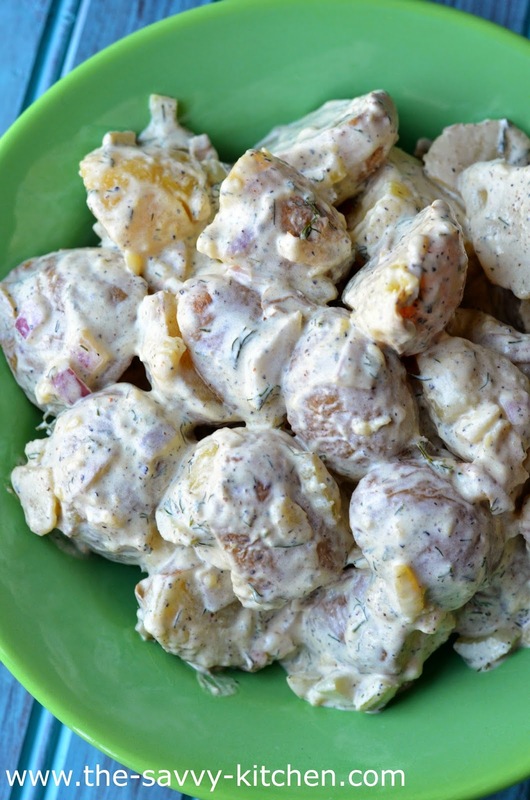 Her potato salad is no exception. I'm normally not a huge fan of dill, but it really livens up the flavors of the mayonnaise-based sauce. Adding two types of mustard also makes it a little spicy. 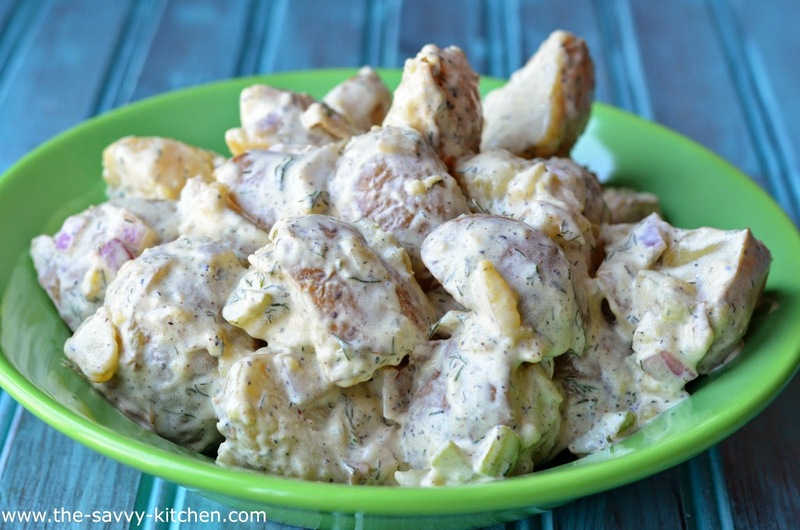 Everyone loves potato salad, and this is a nice change-up from the typical potato salad that is made with eggs, celery and mayo. Try this one out next time you're invited to a BBQ. Enjoy! 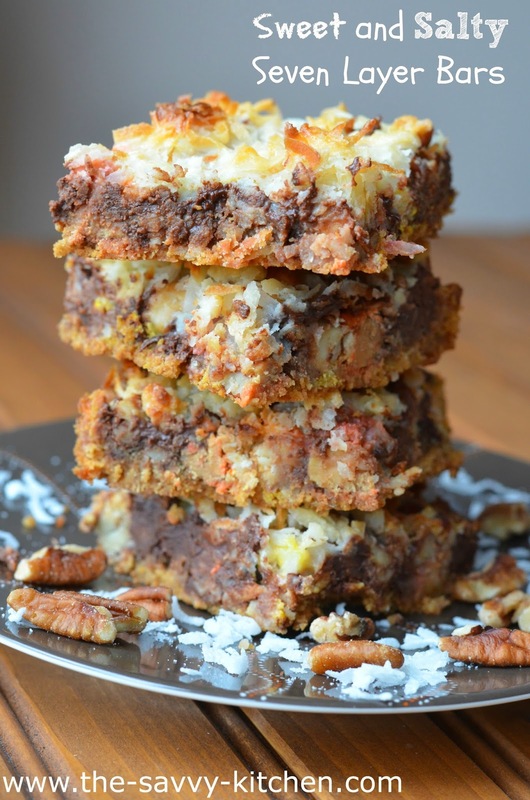 Traditional Seven Layer Bars include a graham cracker crust topped with chocolate, butterscotch, walnuts, sweetened condensed milk and coconut. I decided to put my own twist on them and cater them to what I love. Plus I wanted to clean out my pantry, and decided to use some of the half-empty (or half-full?) bags of goodies I had in there. Topping my list was Reese's pieces, salted peanuts and pecans. Yum. Salty and sweet combinations are one of my favorite match-ups, so it's no surprise that I devoured these. 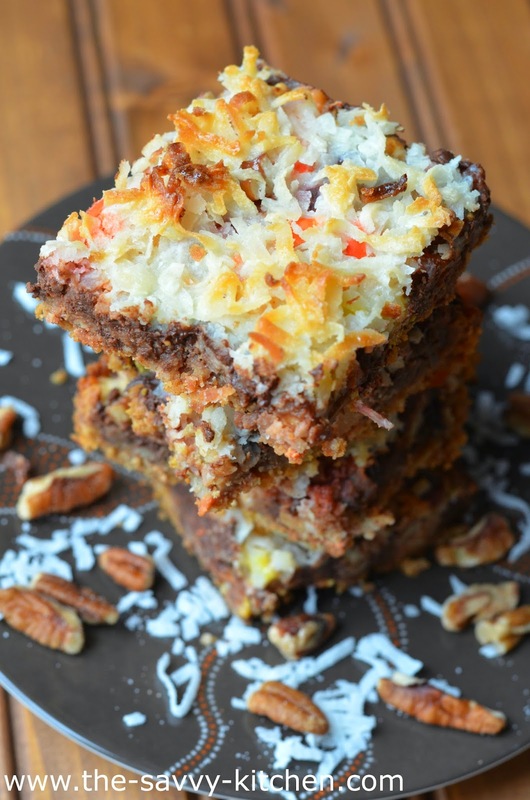 The nuts add some crunch, while the coconut and chocolate add the sweetness that the saltiness craves. Plus the sweetened condensed milk just makes them creamy and decadent. These are incredibly easy to make and would be perfect for any gathering. Enjoy! Mix the butter and graham cracker crumbs until evenly coated. Press onto the bottom of the prepared pan. Spread the chocolate chips on top in an even layer. Do the same thing with the Reese's pieces, peanuts, pecans and coconut, in that order. Drizzle the sweetened condensed milk evenly over the top. 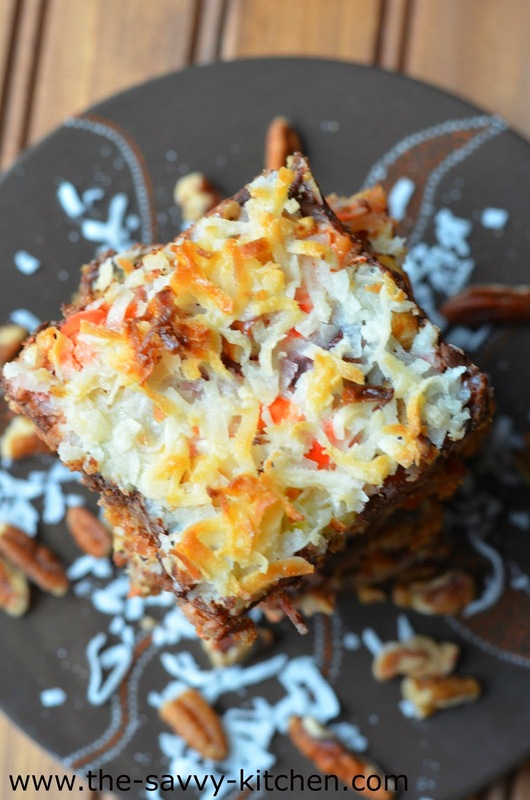 Bake for 23-25 minutes or until coconut is golden brown. Remove from oven and allow to cool on a wire rack. Once cooled completely, cut into 9 bars. Store in an airtight container. 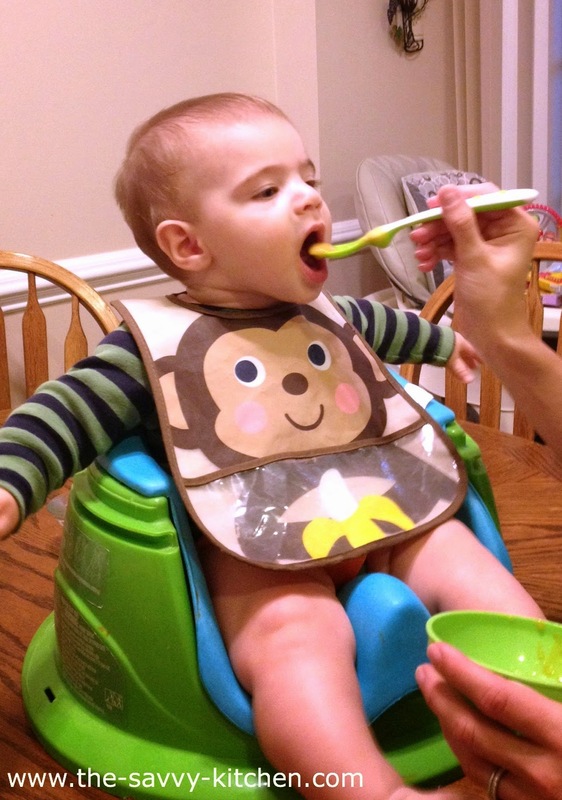 Bradley loves his pears almost as much as he loves his applesauce! I serve these to him in the morning mixed in with oatmeal and apples, and he devours it. Literally. Sometimes I even hear a little "mmm" humming from his lips. His legs also kick out of pure joy the whole time he is eating. It's the cutest thing ever. 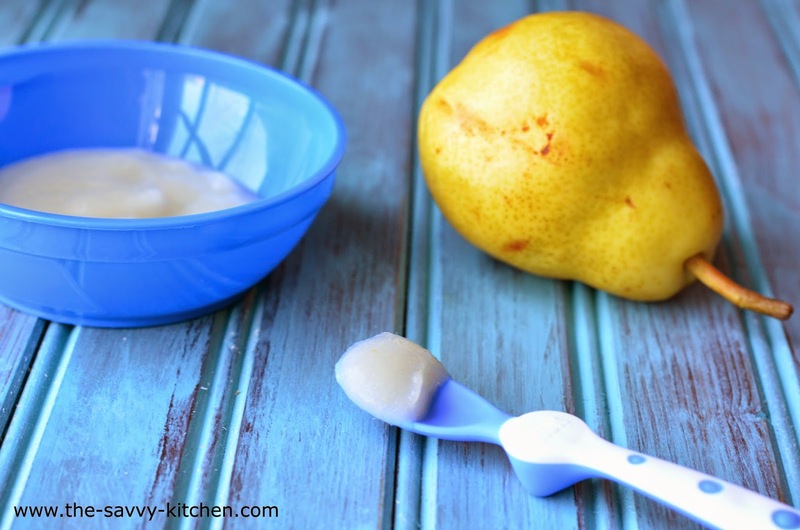 Pears are just as easy to make as apples, so I suggest making a big batch to freeze. I love eating them as well, so you can save a little on the side for yourself while you're at it! Peel and core the pears. Rinse under cold water then cut into chunks. Add the pears to the water and cook for 10 minutes, or until tender. Drain pears and add to a food processor. Add a couple tablespoons of purified water and process until smooth. Add more water, if necessary, to get to your desired consistency. Allow to cool then serve to your baby with a spoon. 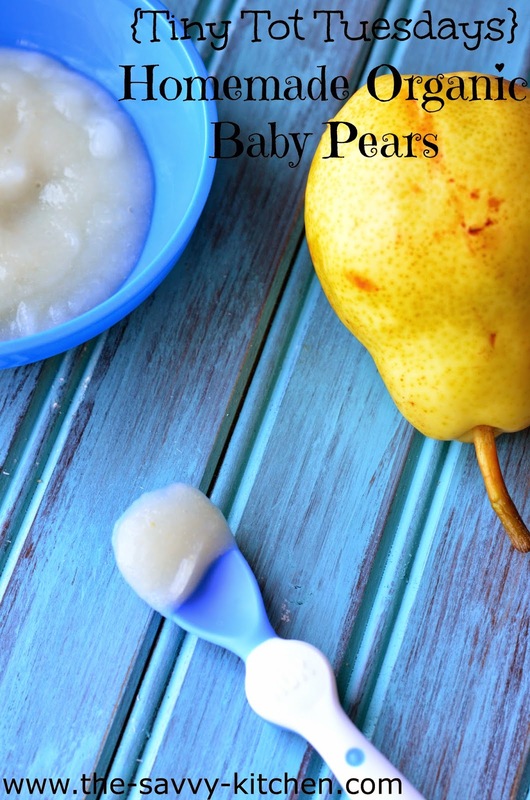 I recommend adding some breast milk or formula to the pureed pears as well...this thins out the pears and adds a flavor they already know and enjoy. If saving for a later date, pour it into storage cups to freeze or refrigerate. You can refrigerate up to 3 days or freeze for 30 days. Make sure you label your pears! Once you are ready to serve, heat the refrigerated or frozen pears up in the microwave and allow to cool to just warmer than room temperature. Add breast milk or formula to thin it out. 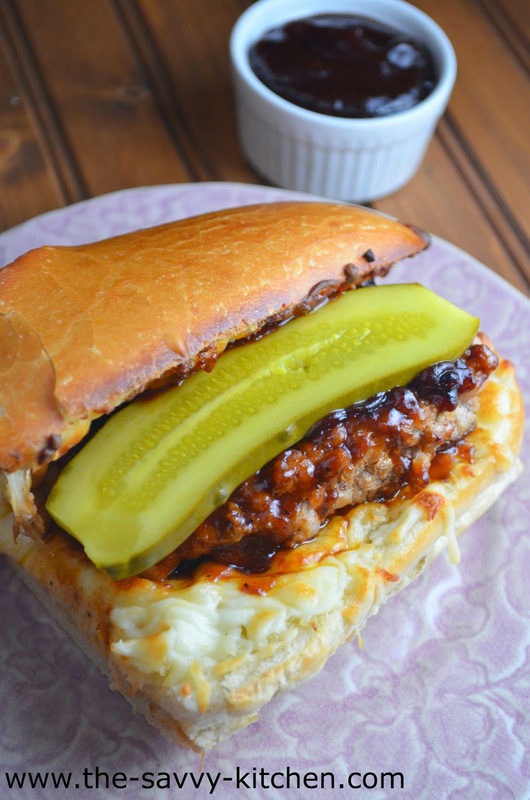 Trust me when I say you need to make a burger using ground sirloin. If you thought that the 95/5 blend in the grocery store was good, this stuff will make your jaw drop. And then quickly close again so you can finish chewing! It literally tastes like you're eating a ground up slab of the best steak you've ever had. 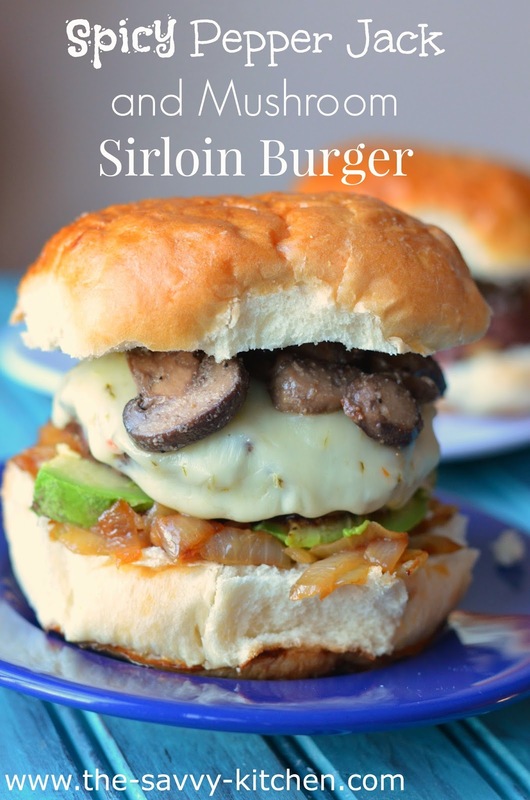 The burger doesn't even need any accompaniments, but I chose to whip up some spicy mushrooms to go with peppery cheese on top. Just because I always need extras on my burgers. This is a burger you're going to want again and again. Enjoy! Divide the beef into four equal portions. Form into burger patties. Cook on the grill for 5 minutes per side, or until they reach your desired doneness. For the mushrooms: (This can be done well beforehand) Turn a small skillet or saucepan on medium heat. Add butter and melt. Add mushrooms, Worcestershire sauce, red pepper flakes, garlic powder, salt and pepper. Stir to combine. The mushrooms will release a lot of water, but by the end of cooking they will absorb all the liquid in the pan. Cook for 7-10 minutes, or until mushrooms are tender and liquid is absorbed. 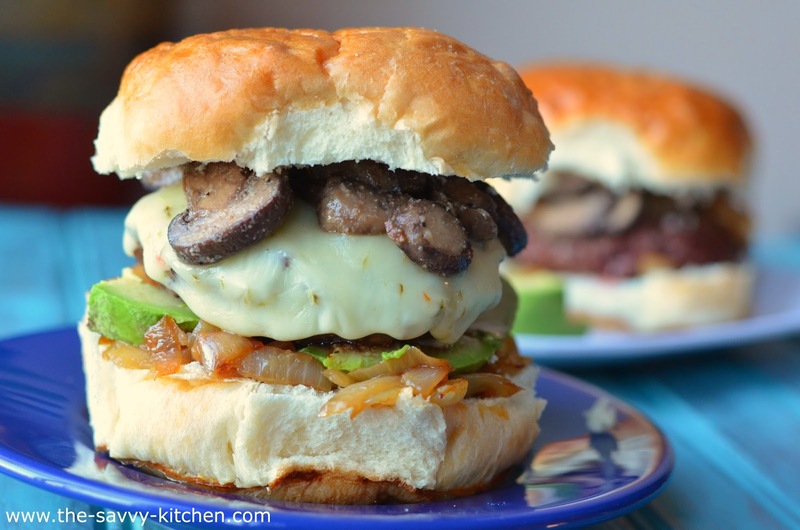 To serve, place the burgers on a bun and top with some sliced mushrooms. Add avocado and caramelized onions, if desired. Some people collect coins. Some collect stamps. Some collect seashells. Me? I collect recipes. It's a bad, bad addiction. I have recipes in my online bookmark folder, on my Pinterest boards, in my recipe binder, on my refrigerator. They're seriously everywhere. I had this recipe sitting around for a while, but it's one I knew I wasn't going to let fall by the wayside like the rest of them. Chris wouldn't have that either. We saw this sandwich being made on Food Network, and I immediately bookmarked it. And I'm SO so glad I did. 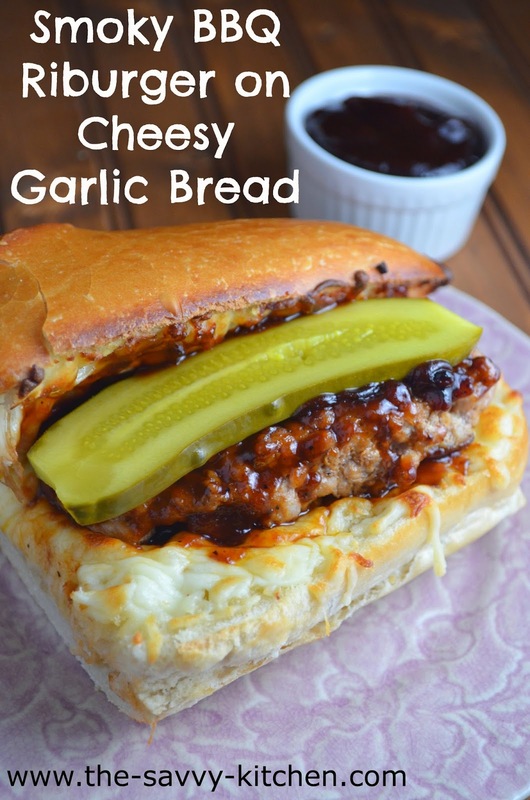 I think the cheesy bread is my favorite part (obviously), but the tangy BBQ sauce that the riburger is coated in is just amazing. Especially when it gets a little charred while grilling. Top your sandwich with a refreshing dill pickle, and you've got yourself a meal. Enjoy! For the sauce: Add the BBQ sauce, garlic, Worcestershire sauce and red pepper flakes to a small pot over medium heat. Simmer uncovered, for 5-10 minutes or until heated through. For the burgers: Meanwhile, preheat the grill top to medium-high to high heat. 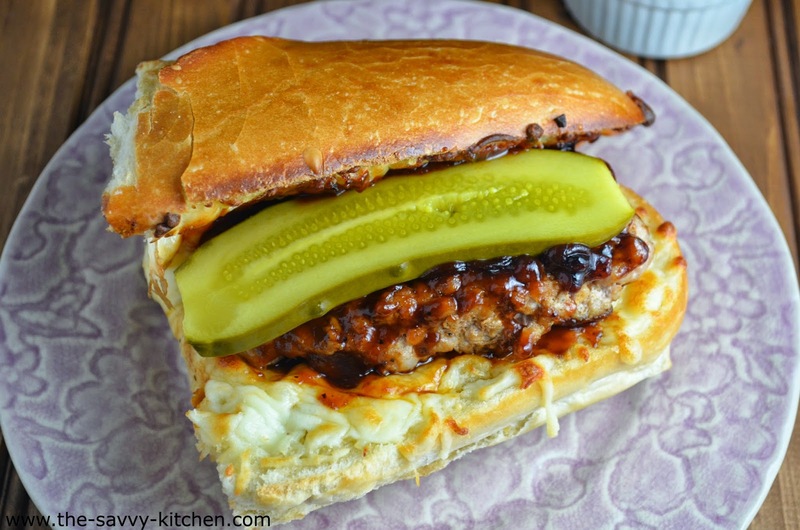 Form the ground pork into long and rectangular patties that fit the shape of the bread, keeping in mind that there will be 2 patties per half of bread. Sprinkle the exterior with salt and pepper and place on a hot grill top for 3 minutes. Flip and cook another 3 minutes. Turn off the heat and baste generously with the BBQ sauce. Flip and continue cooking for a couple more minutes, continuously flipping and basting the burgers. For the bread: Place the rack in the middle of the oven and set the oven to broil. Mix the melted butter with the garlic and brush on the cut sides of the bread. Top with the cheese and place under the broiler just until the edges are lightly crisped, about 2 minutes. For the sandwich build: After your garlic bread is done, place 2 burgers on each bottom half of bread. Top with some pickles and the top half of the garlic bread. Slice each portion in half, yielding 4 sandwiches. Serve with the remaining BBQ sauce on the side. I typically don't buy cookies from the grocery store, unless they're something that just can't be replicated. Oreos, Fig Newtons and Nutter Butters top that list. Also on that list? 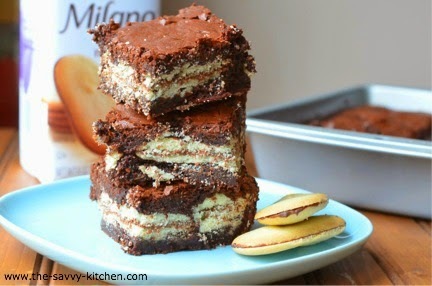 Milano cookies. And I only buy them when they're on sale. It's a little rule I have. I'm annoyingly frugal like that. So when my favorite Milano cookies were on sale, I snagged a bag and couldn't wait to get them home. I dunked one in milk and it was pure bliss. But with the rest of the bag I decided to bake them into one of my favorite treats: brownies! I just split up the brownie batter and layered them in the middle. The result was a soft and chewy concoction of two of my favorite sweet treats! 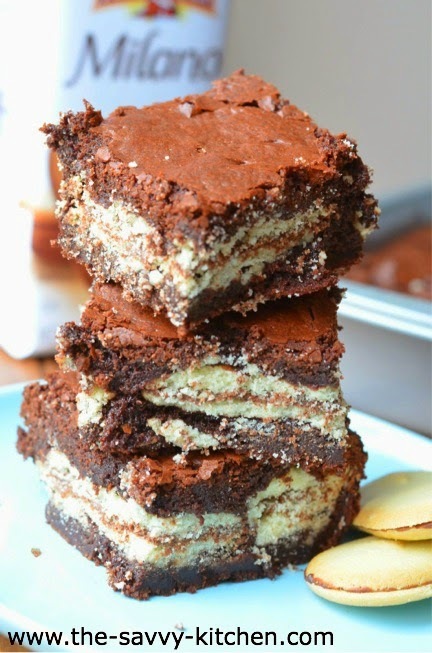 A fudgy, chocolaty brownie and a light and buttery Milano cookie. Enjoy! Preheat the oven to 350 degrees F. Lightly grease a 8x8" pan. Crack the eggs into a bowl, and beat them with the cocoa, salt, baking powder and vanilla until smooth. In a saucepan set over low heat, melt the butter. Add chocolate chips and stir until melted. Add sugar and stir until combined. Remove from heat. Add the butter mixture to the cocoa mixture and stir. Add the flour, 1/4 cup at a time, and mix until just combined. Spoon half of the brownie batter into the prepared pan. 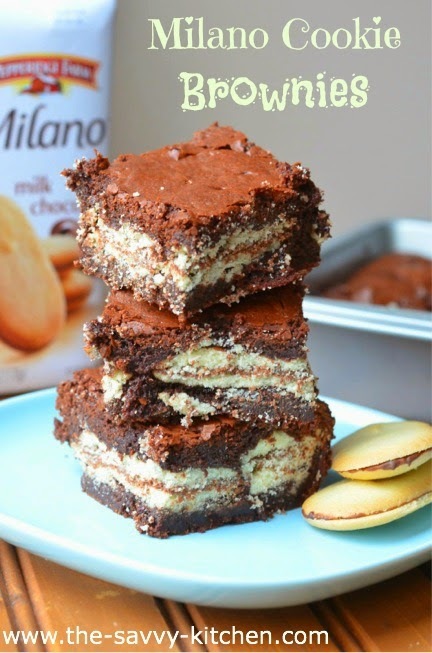 Place the Milano cookies on top of the batter in an even layer. Top with remaining brownie batter. Bake the brownies for about 25-28 minutes, until a toothpick comes out clean. Remove them from the oven and cool on a rack before cutting into 9 bars. Applesauce is one of those things that I'm sure most people just prefer to buy, and that's completely fine. You can purchase it organic and sweetened or unsweetened, so I can see why it's a good option for most people. 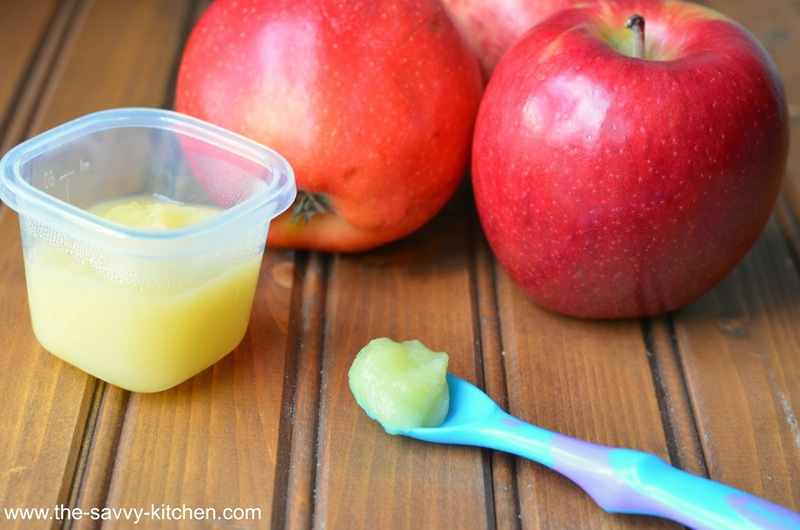 I still prefer to make all of Bradley's food, even applesauce, and here's why: I can choose which types of apples to use (Gala are his favorite) and make it the consistency he likes (not to mention I want to avoid all those preservatives and whatnot). Chris and I love applesauce, too (who doesn't? ), so when I make Bradley's I make a big batch for us to split. I keep Bradley's half plain and then whip up the second half with cinnamon and other flavors that Chris and I like in our applesauce. It's a win-win! 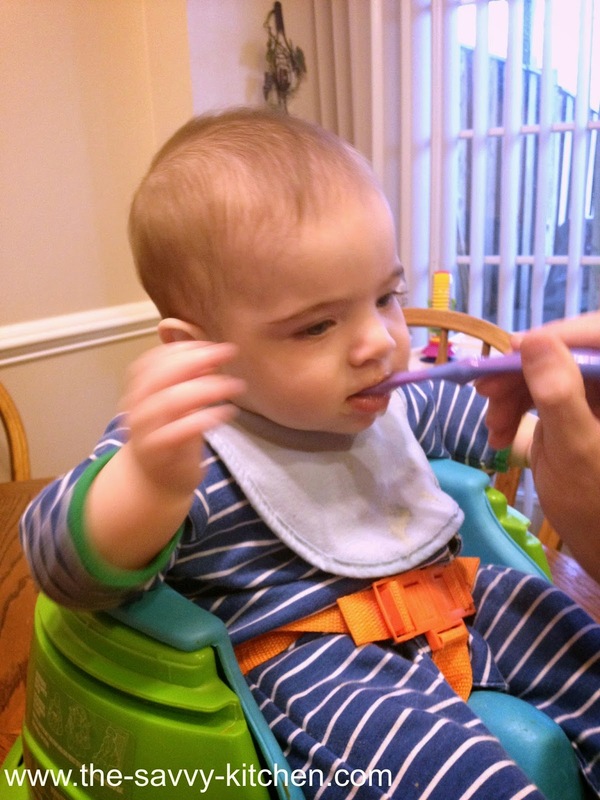 Bradley loves applesauce for breakfast, especially mixed with oatmeal! Peel and core the apples. Rinse under cold water then cut into chunks. Add the apples to the water and cook for 8-10 minutes, or until tender. Drain apples and add to a food processor. Add a couple tablespoons of purified water and process until smooth. Add more water, if necessary, to get to your desired consistency. Allow to cool then serve to your baby with a spoon. 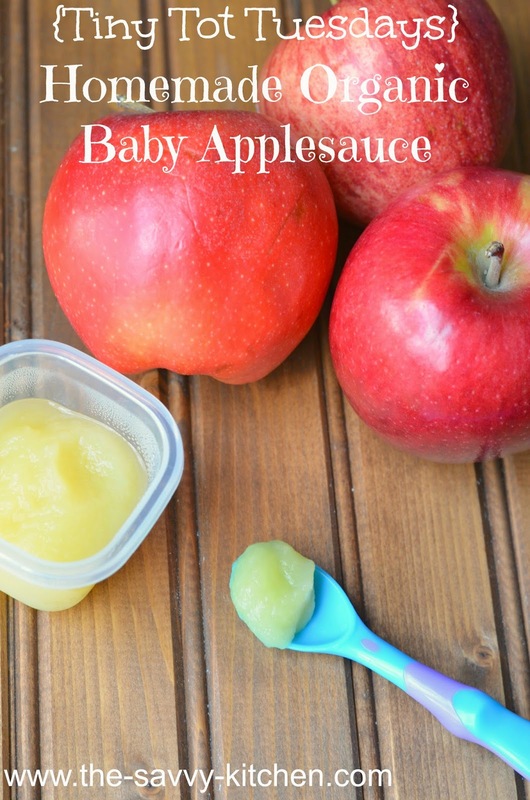 I recommend adding some breast milk or formula to the pureed apples as well...this thins out the apples and adds a flavor they already know and enjoy. If saving for a later date, pour it into storage cups to freeze or refrigerate. You can refrigerate up to 3 days or freeze for 30 days. Make sure you label your apples! Once you are ready to serve, heat the refrigerated or frozen apples up in the microwave and allow to cool to just warmer than room temperature. Add breast milk or formula to thin it out. Happy Cinco de Mayo! I'm sure everyone will be partaking in their fair share of chips and salsa consumption today, so it's pretty crucial that you have a tasty cocktail to wash it down with. 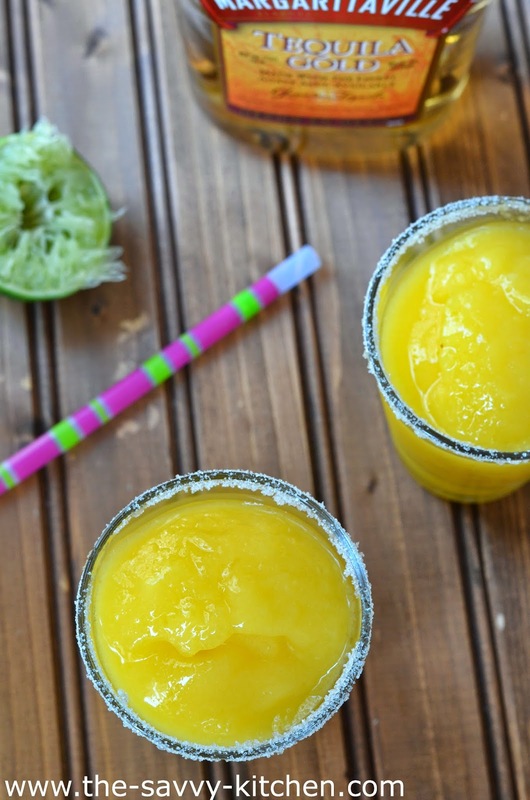 I made these mango margaritas using a fresh mango, and they turned out so refreshing and sweet, so I can't wait to share them with you all! 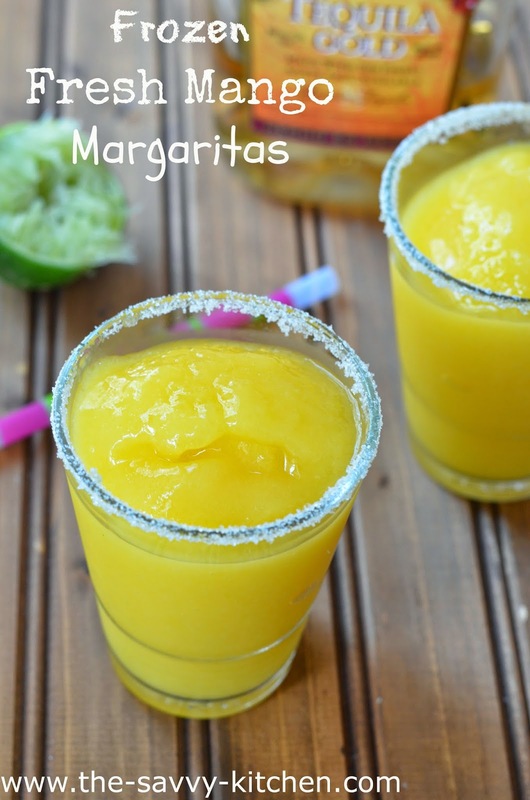 The little bit of additional sugar that is added to these margaritas brings out the natural sweetness of the mango. If you want to make these for a family celebration, you can leave out the tequila when blending up the ingredients. Then just top off individual glasses with tequila for the adults so your little kiddies can enjoy their own virgin versions of this refreshing cocktail. Enjoy! 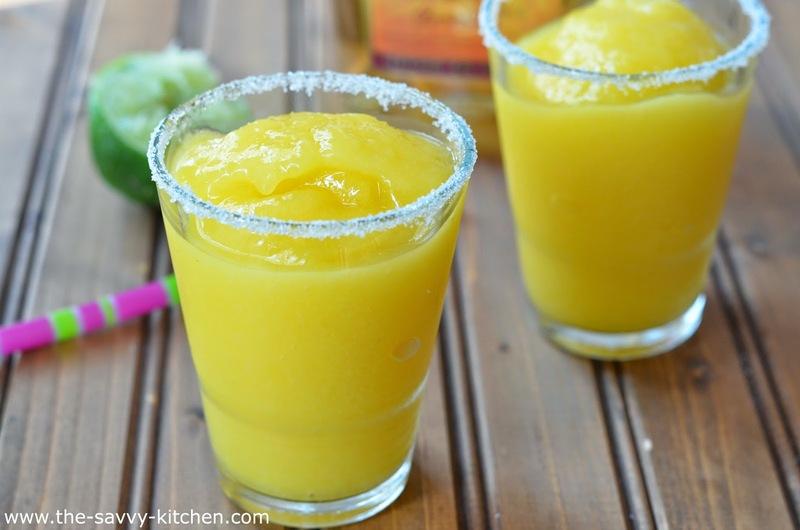 Add mango chunks, ice, 3 tbsp. sugar, lime juice and tequila to a blender. Puree until smooth. Pour a small amount of sugar onto a plate. Trace the squeezed lime around the rim of 2 glasses. Flip the glasses upside down in the sugar so the rim gets fully coated. Pour the margarita mixture into the glasses and serve. 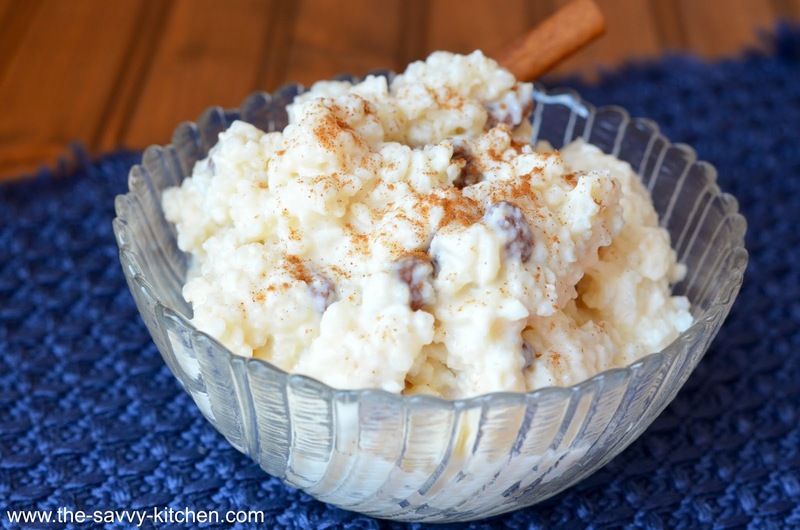 My mom makes amazing rice pudding, but recently I heard about another type of rice pudding that uses sweetened condensed milk in place of some of the milk. Have you ever had sweetened condensed milk? It's basically milk that has had all the water removed, and then sugar is added. Sounds amazing right? 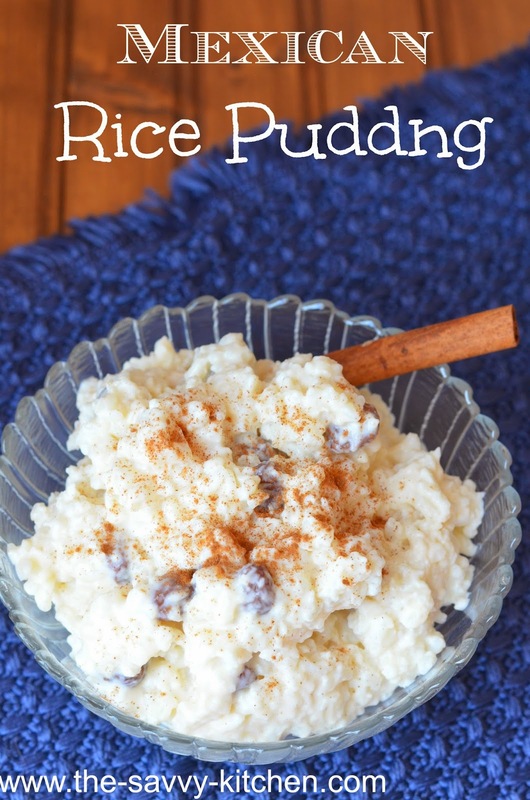 I could eat it straight from the can, so as soon as I heard about this other rice pudding recipe I jumped right on that train. I couldn't wait to try it. 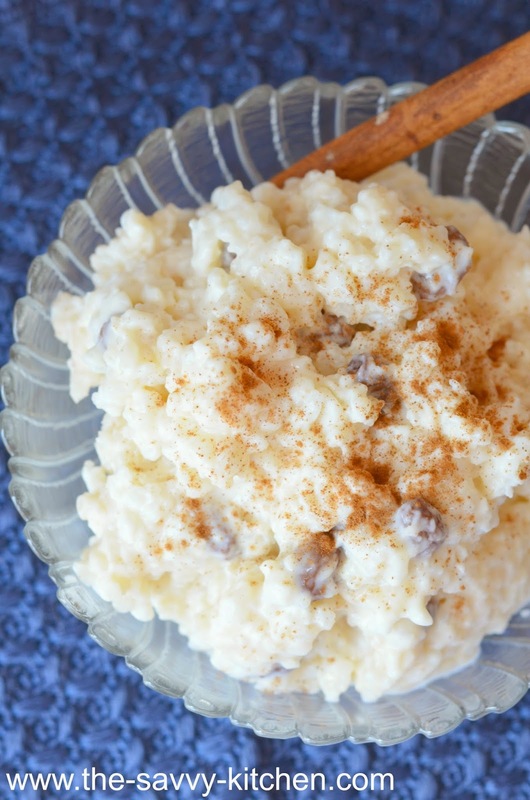 Mexican Rice Pudding is just as creamy and delicious as traditional rice pudding, but the sweetened condensed milk adds a nutty, sweet flavor and makes the pudding a little more silky. I opted to use some reduced-fat milk in this recipe because it made me feel a tad bit better about myself after devouring almost the whole thing. This is definitely one for the recipe binder and would be perfect for your Cinco de Mayo celebration. Enjoy! Put the water, rice, and cinnamon stick in a medium saucepan over medium-high heat. Bring to a boil and cook uncovered for 18 minutes. Once rice is done, use a sieve to drain out the remaining water. Discard cinnamon stick. Return the cooked rice to the saucepan. Add the reduced-fat milk, sweetened condensed milk and heavy cream. Once the mixture comes to a boil, turn the heat to low and cook for an additional 15 minutes or until rice is thick, stirring constantly. Once done, add raisins and stir to combine. Transfer the mixture to a bowl and refrigerate until chilled, about 2-3 hours (or you can serve at room temperature). Dust the pudding with cinnamon before serving.